2. Melt the dark chocolate and butter together. I fill a pan 1/2 way with water and then place a bowl on top with the items inside, place on a low heat to melt. 3. Mix the eggs and sugar together until thick and creamy. 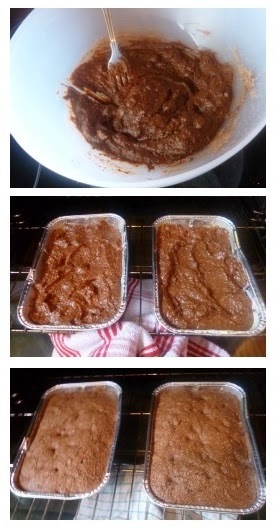 Gently fold in the melted chocolate mixture in and then slowly add the flour and cocoa powder. 4. Roughly cut up the milk chocolate and add this into the mixture last. Pour the mixture into the cake tin and place in the oven for around 30 minutes or until cooked. 5. Take out and allow to cool for 5 minutes before removing from the tin. 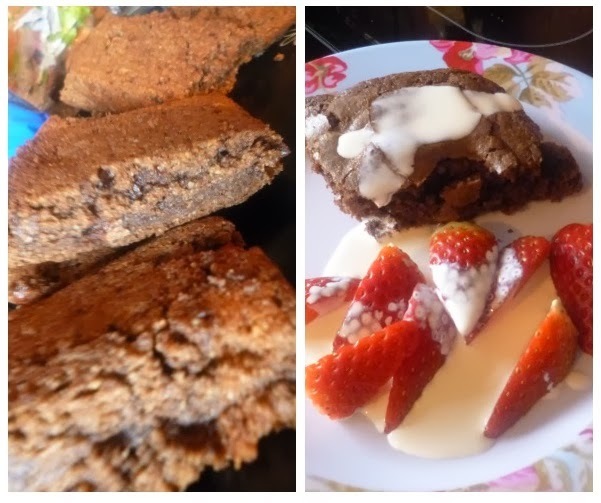 I serve them with strawberries and cream which is lovely but you can also add ingredients into the mix to make your own flavours. To make Chocolate and Almond Brownies, add 100g chopped or powdered almonds to the mix for either a crunchy bite or a smooth taste. To make Chocolate Orange Brownies, add the rind of one orange to the mix. Make sure to grate it finely. Baking is not hard. It's all about getting your hands dirty and trying different ingredients out until you get the desired taste. Always make sure you have a good range of utensils and bakeware to use. We get ours from www.thehomewarescompany.com who have a huge range to pick from and a plethora of quality items. This was actually a post that was supposed to go live a few weeks back but for some reason (which I only just realised) it was still in my drafts folder and wasn't published. So for that reason, I have updated it a little. The wet weather can be horrible sometimes. We have all probably seen all over the news about the floods down south. The destruction it cause when it's at its peak is so immense, you wouldn't think that so much bad can happen from water. We seem to have been lucky, with only getting small amounts of rain and wind. Yes, it is very bad when it comes, but it never lasts long so we have had no flooding. So, at the moment, we are trying to make the most of this weather as you never know when the worst of it could hit us. 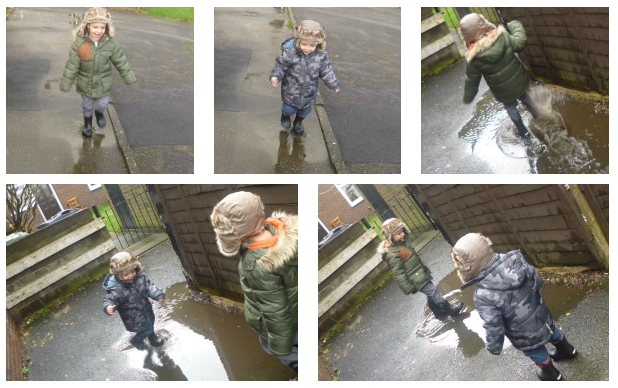 We have been outside in the rain, playing. 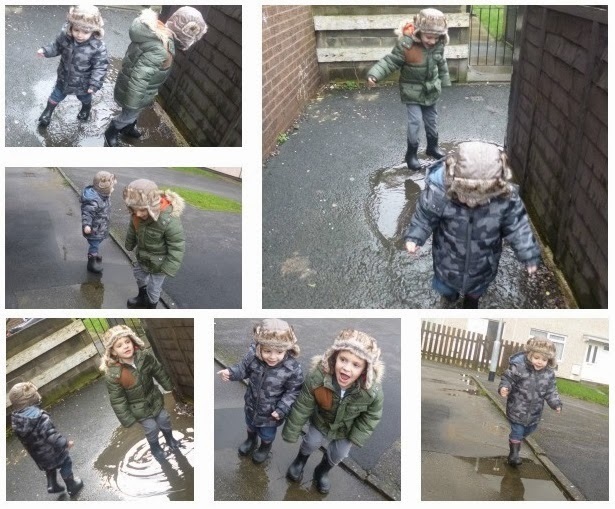 Wrapped up warm in jumpers, coats, hats and wellies, it has been nice for the boys to get outside for a bit whilst the wind calmed down. I'm sure that we all know how hard parenting is. Trying to keep our children clean and tidy. But you know, sometimes, it's nice for them to just get mucky, messy, muddy and wet. Why not, they will only be young once. Splashing, running, jumping and falling, the boys were absolutely soaked afterwards, but they had fun and that's all that matters. 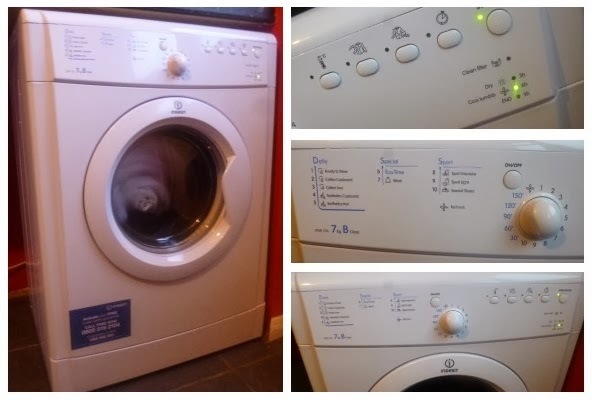 Buying An Indesit IDVA735 Tumble Dryer After Another Appliance Bites The Dust! As always, we have planned to do things, places to go, things to buy, gifts to sort out, and then something breaks. I'm sure that fate waits for us to just get our finances sorted and then kicks us back down. So this week we had to get a new tumble dryer as ours went kaput. We set a list of everything we would need, the size of the drum, timer, price etc and then started our search. I wanted to make sure that we were prepared before looking so we would not be disappointed with what we could afford. I knew that I wanted a vented tumble dryer. This is the one most important thing you will need to know before buying one. There are 2 types, a vented and a condenser. A condenser works by removing moist air from the drum and collecting it into a container inside the dryer itself which can be emptied regularly. A vented tumble dryer works by sending the moist air through a hose at the back of the machine and out of an external wall. You will need either an open window to put the hose through or some where to place it so that the air can get outside. We have a fitted vent hole in our wall which is why we picked vented, that and the fact that vented tumble dryers use less energy and are cheaper to run. 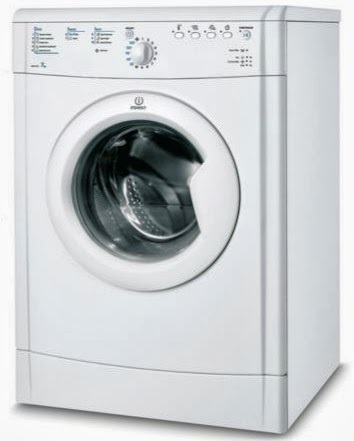 After a while of searching, researching and checking reviews, I went for the Indesit IDVA735 Tumble Dryer. It was an online exclusive and was on sale too, I do love a good bargain! After trying to find a tumble dryer with a big drum (our washing machine holds 12kg) we eventually settle on this one as it was in our budget range and had the biggest drum of the options. This Indesit tumble dryer also seemed to have more functions available on it too. A sensor to stop it working once the clothes inside are dry, up to a 24 hours delayed start and a anti-crease option all sold it to me. Inside, it looked huge as it can fit in 7kg so that is a lot of drying in one go, a lot bigger than our old one. It has a fluff filter which catches all the excess lint coming from clothing. This is located just under the door and can easily be removed for cleaning. It also has a filter full indicator which comes on when the filter is full and also every time the machine is switched on. 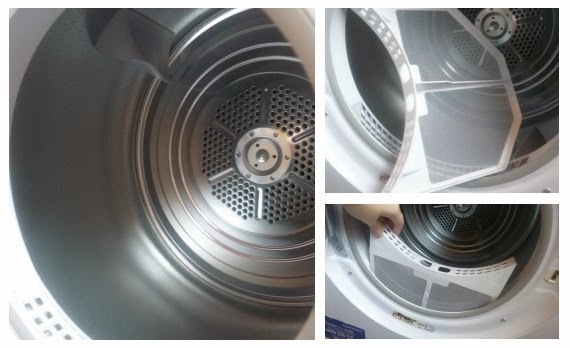 The dryer will work quicker if this is emptied so it's always best to check before each use. The electronic controls are super easy to follow. You can choose different time settings to suit what you are drying, from a 10 minute cool refresh right up to a full 3 hours of drying time. There are then also other varying settings, high heat, anti-crease and timer delay. I think the only one negative I would give it so far, is that even though you can set it to a different times, once started there is no indicator of how far it is through the cycle. It's not really a big problem for us but can get annoying when we are wanting to go out and waiting for the tumble dryer to finish. On the plus side though, it is a very quite machine, probably the quietest I have heard. A tumble dryer is a must have for quickly drying our families clothing and there are many different ones to choose from based on the spec you need and your budget. Always search for the one that suits you and your needs best. There are some great deals to be had on tumble dryers, check them out here at Argos. I am a hopeless romantic. Every year, surprising my husband with something or other. I love the little things though like baking yummy treats and making his favourite food. This year, my husband will be working an early shift on Valentines Day so I thought I would surprise him when he gets home with a nice fry up and some homemade biscuits. Asda are helping me in getting prepared for this by supplying me with a couple of items from their Valentines range. First up is the Sweetheart Egg Shaper. This is priced at just £1 and is a rubber heart which goes into the frying pan and an egg is cracked open inside it. The egg then fries in the heart shape and the shaper can easily be removed once cooked. I love this item as it gives that subtle heart on a Valentines surprise breakfast. Secondly is the Sweetheart Cookie Cutters. Realisically, the same premise as the egg shaper. They are heart shaped and once pressed into the cookie dough, give cute heart shaped biscuits. Coming in 4 different sizes to suit what we are making, I imagine these getting used a lot in the future when we are baking. The Love hearts Tea Lights are super cute and smell divine. They are a pack of 6 tea lights, each with their own romantic message on the top and each colour having a different lovely scent. 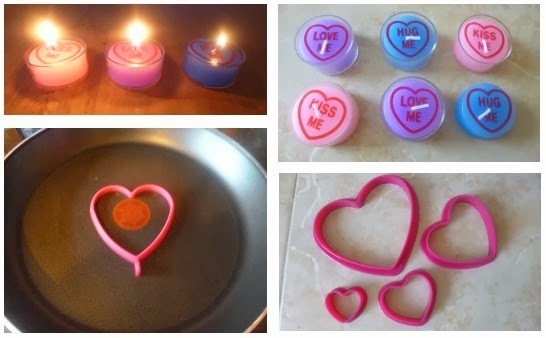 These will definitely be getting used on Valentines Day to give that subtle lighting and make it even more romantic. Don't worry, I will be sharing photos of these items in use over the coming days but at the moment have no eggs to fry or bake with and wanted to get this post up as soon as possible so you lovely lot could see the items before Valentine's Day. These items and many, many more Valentines Day themed items are available instore and on the Asda website too. 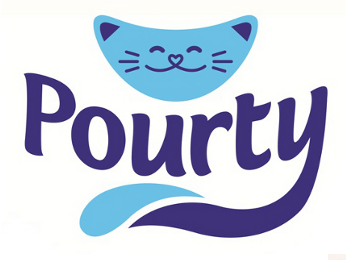 Pourty was the brain child of Jon Rathbone, the inventor of the Pourty potty and the subsequent range of toilet training items. After realising that potties were messing to empty after they had been used, he got to work trying to figure out a better way to make them so that they are easier to use and that's how Pourty was born. The Pourty Potty has a unique pouring duct and anti-drip lip so you can pour all waste matter away with no messy dribbles. I love the idea of this, but for Charlie, he decided that he doesn't want to use a potty, opting instead for the toilet, so he could be like his big brother. 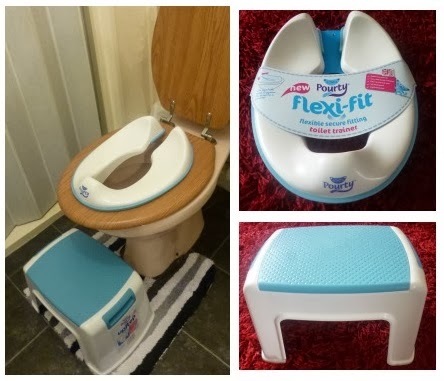 It was a nice surprise to see that Pourty had catered for the toilet users too bringing our the Flexi-Fit toilet seat and the Up Step. As most adult seats can vary in size the Flexi-Fit seat alters to be able to fit most toilet seats. We have gone through a few training seats before but, with them not being able to alter, found that they would wobble whilst Thomas was sat on them which was off-putting for him. The Flexi-Fit seat wont do this as it has unique prongs underneath it so that it fits securely and doesn't wobble. They are easily adjusted to fit most toilet seats. The splash guard at the front means that there is no weeing over the toilet seat which is a great part for boys as I don't know how many time I have had to clean the floor after one of them has been to the toilet. The Up Step is a great idea, in my opinion. It is a step used so that children who are toilet training, can easily get onto the toilet themselves. The Up Step is higher than other steps stools thought meaning that, when on the toilet, the child's feet are supported instead of dangling and it helps them to go to the toilet. 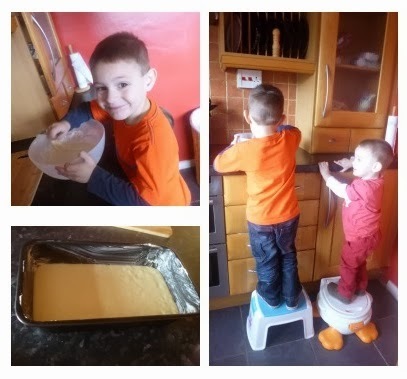 It is very strong, even I can stand on it safely and is lightweight also thus meaning that both boys can easily manoeuvre it from the toilet to the sink for washing their hands afterwards. Overall, I love both the Flexi-Fit seat and the Up Step and so far, Charlie seems to be taking a liking to them, wanting to get up onto the toilet using them and sitting there giggling at me. I still think that it is a little too early for him to fully grasp the idea but at the moment, it is great for him to be learning and getting used to the seat and step. You can find out more information on the Pourty website where you can buy the items. They are both also available on Amazon too. I have made Lemon Drizzle cake a few times now but my mum has finally perfected the amounts and so I thought I would give you the recipe. 1. Preheat the oven to 180C and grease a 7inch loaf tin. 2. Beat the butter and sugar together for about 2 minutes with an electric whisk or until creamy and then mix all of the other ingredients in till smooth. 3. Pour into the greased tin and bake in the oven for around 45 minutes. Tip: Check it is cooked inside by using a metal skewer in the centre of the cake. Hold it in the cake for 10 seconds and then remove. If it is clear then the cake is ready but if their is cake residue then leave to bake a little longer. 4. Remove cake from the oven to cool in the tin for 10 minutes. After this, gently remove from the tin and leave to cool for a further 50 minutes. 6. Leave for an hour until the icing on the top is set and then cut into slices to enjoy. And there you have it. Simple Lemon Drizzle cake that is super yummy!